Just how do you freeze a building as iconic as Senate House in London’s Russell Square and get it to look like it’s being scaled by an ice climber? That was the challenge for interactive arts and technology collective Seeper for their latest project. Rather than put their money into a traditional billboard ad, car giant Ford turned to Seeper to create stunning visual effects for the launch of their latest S-MAX car. 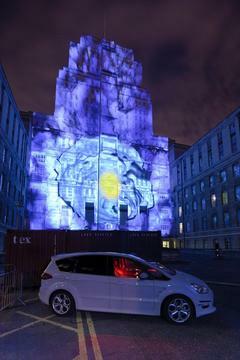 Using the latest projection mapping technology and real time 3D graphics, Seeper were able to create the impression that the building had indeed been frozen like a scene out of a superhero movie. Up next is Liverpool which will be ‘frozen’ tomorrow night (September 11). For more details click here: http://www.facebook.com/event.php?eid=149424621747764&index=1. See the sponsored video below to find out how Seeper managed to create the effects for the S-MAX launch. Twitter users – older than you think..